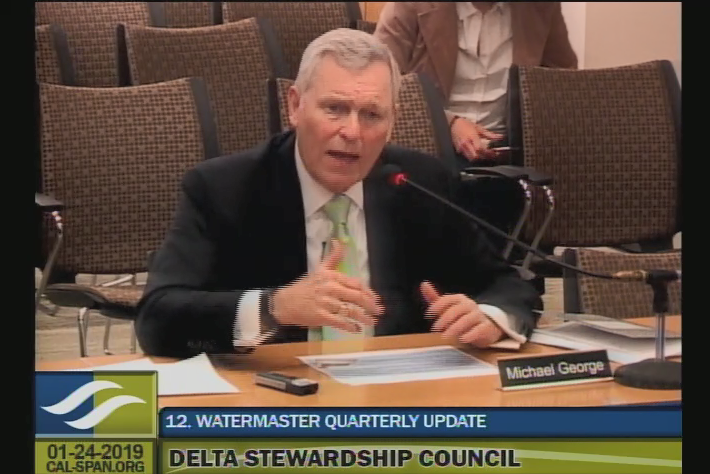 In Delta Watermaster Michael George’s quarterly update to the Council, he discussed the new appointment on the State Water Resources Control Board, the status of the Bay Delta Water Quality Control Plan, what is being done to address both of the loss of channel capacity in the south Delta and salinity issues in the South Delta; and the State Water Board’s outreach efforts for implementing the diversion measurement regulation under SB 88. 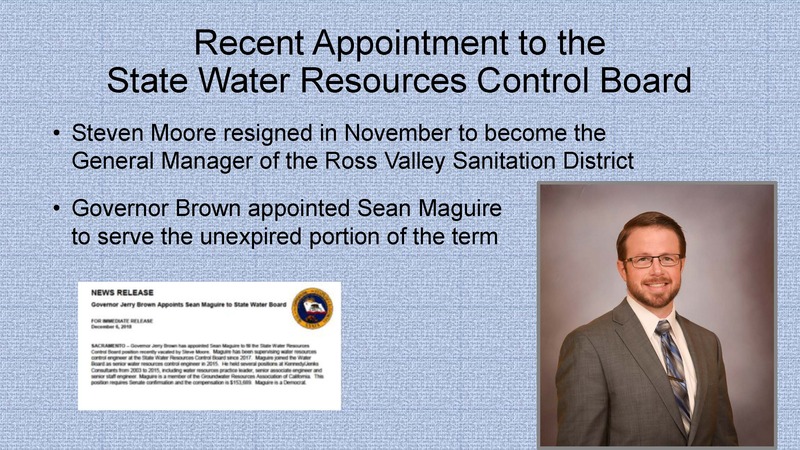 Steven Moore, Vice Chair of the Board, resigned in November to take a job as the General Manager of the Ross Valley Sanitation District. In his place, Governor Brown appointed Sean Maguire to serve the unexpired portion of Mr. Moore’s term, which is about another year. Mr. Maguire has been with the State Water Board for about three years now. 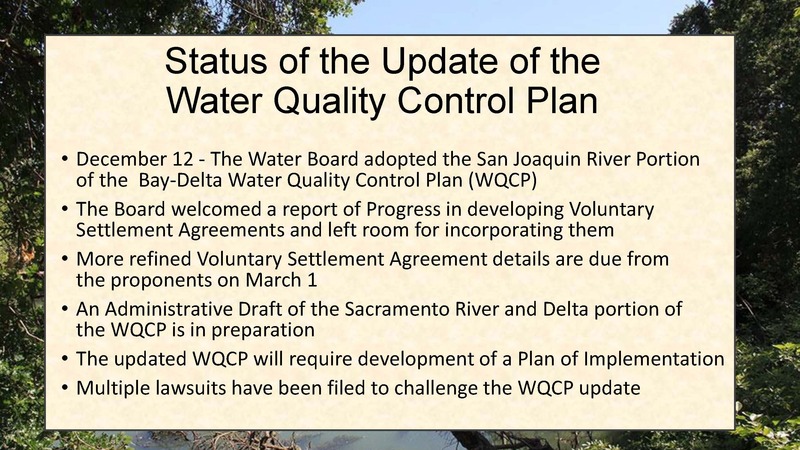 On December 12, after delaying the decision on two occasions, the State Water Resources Control Board adopted staff proposed amendments to the San Joaquin River portion of the Bay Delta Water Quality Control Plan. The part attracting the most attention was the proposal to increase the amount of flow through the tributaries on the San Joaquin River and into the Delta based on the unimpaired flow on the three main tributaries and the main stem of the San Joaquin River below the confluence with the Merced River. The board members delayed the decision twice, first in August and then again in November, in order to allow for more time for participants to negotiate alternatives to the regulatory approach and reach voluntary settlement agreements. At the December 12, a proposal was presented for a partial voluntary settlements that was primarily focused on the Sacramento River and part of the Delta, even though the plan that was before the Board was the portion on the San Joaquin River, he said. Only one of the three tributaries, the Tuolumne River, had a proposal for voluntary settlement in lieu of the regulatory approach the Board was considering. Nonetheless on December 12, the Board did vote to adopt the plan, but specifically invited refinement of the voluntary settlement agreements that had been presented. Mr. George pointed out that the plan itself is not self-executing; it requires the development of an implementation plan. However, it may be possible for the implementation plan to develop in parallel with the voluntary settlement process. “My own view is that we may be able to create an environment in which those processes are attractive and positive enough for everybody to participate and do that in part by indicating specifically what the biological objectives are, not just the regulatory objectives but what are trying to accomplish in terms of floodplain habitat, number of fish, etc,” he said. Chair Susan Tatayon asks if the process for defining the biological objectives will happen before the March 1 refined Voluntary Settlement Agreement? Dr. John Callaway said the public draft will be available in early February; they will be presenting their draft to staff on March 5 in a public workshop. The year 2017 was a record year for precipitation by some measures, with inflows into the Delta laden with sediment and other material. Once the flows reached the Delta, the water would slow down and drop a lot of sediment. 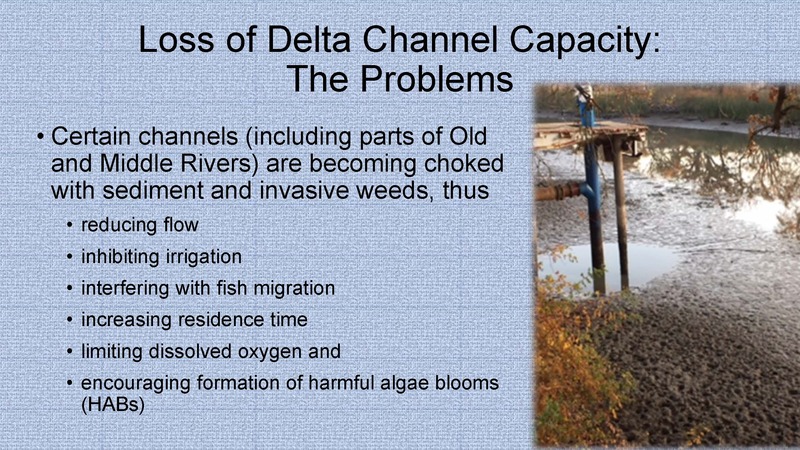 This has caused a serious reduction in the carrying capacity of many of the southern Delta channels. Mr. George explained that in the past, there was a stalemate between farmers who needed the channel capacity and environmentalists concerned for exposing mercury and other metals in the sediments, and as a result, permitting for dredging and channel maintenance slowed down over concerns of lawsuits. 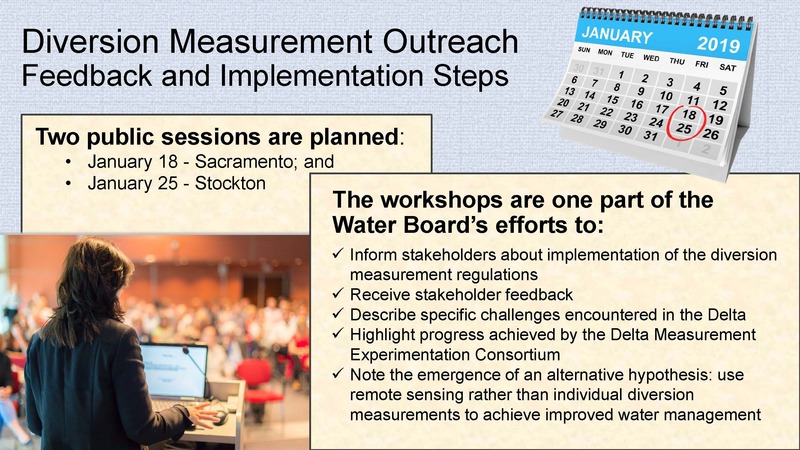 An ad hoc group of stakeholders have come together, which includes the Central Valley Regional Water Quality Control Board, the South Delta Water Agency, the San Luis Delta-Mendota Water Authority who operates the federal pumping system, the Bureau of Reclamation, the Department of Water Resources who operates the State Water Project, as well as the State Water Contractors. They haven’t put together a proposal yet, but the group is vitally interested in this and is trying to figure out what makes sense. Salinity in the southern Delta has been a long standing issue. 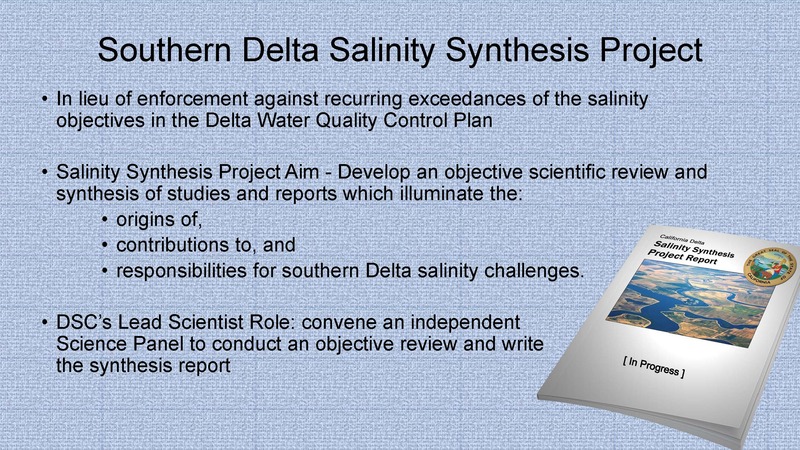 So rather than taking enforcement actions against periodic exceedances of water quality control plan salinity objectives in the southern Delta, everyone has agreed on a process where all the stakeholders will come together as an oversight committee. The committee will be tasked with identifying specific questions to ask an independent panel of scientists, who will look at studies that have been done and prepare a synthesis of what is known, what has been tried that works and doesn’t work, and identify knowledge gaps to inform decision makers of possible courses of action. Lastly, Mr. George noted that the Division of Water Rights has convened outreach sessions to talk to diverters in the Delta watershed as well as throughout the state to hear from the community about how it is progressing and the challenges in implementation in order to see how they can help to continue to move that ball forward. The meeting also included a review of the 2018 accomplishments and the priorities for the coming year. Executive Officer Jessica Pearson listed the accomplishments, which include adopting amendments to the Delta Plan, significant progress made on the ecosystem amendment, and a new website to be unveiled soon which will display Delta Plan performance measures. Council staff provided nearly 30 formal comment letters intended to make sure that projects that may potentially be covered actions are aware of the Delta Plan’s requirements and directions. In 2018, the Council also received ten consistency determinations and the first appeals to the covered actions process. Deputy Executive Officer Jessica Law then discussed the 2019 priorities. 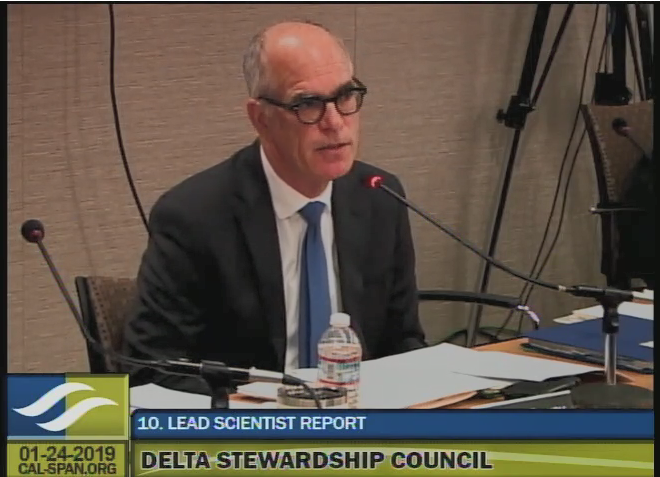 2019 tasks are organized into four areas: Strengthening and implementing the Delta Plan, Building capacity for One Delta, One Science, strengthening leadership and communications, and core functions. Major tasks this year will be completing the 5-year review of the Delta Plan as required by the Delta Reform Act, completing the Ecosystem Amendment to the Delta Plan, and working on a Delta Climate Change Vulnerability Assessment and Adaptation Strategy. 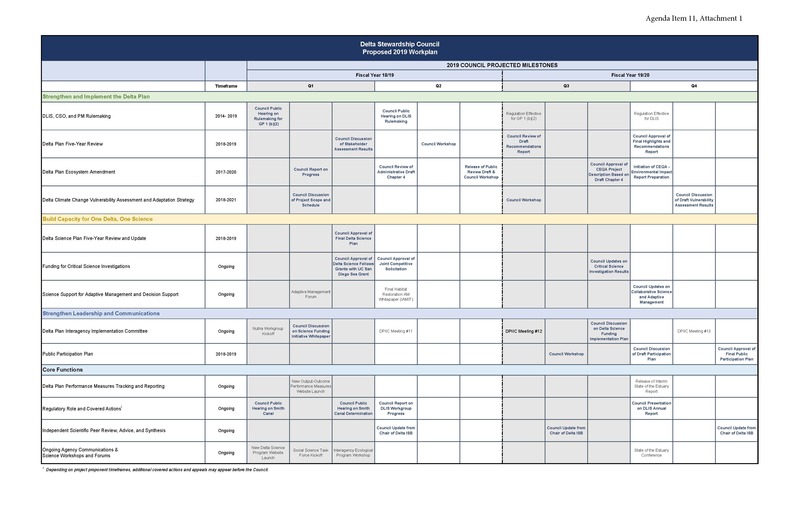 Ongoing activities will include adaptive management and decision support, performance measures tracking. The staff will also work on the development of a public participation plan for the Council. There were more consistency determinations filed for covered actions last year than any other year; staff expects that level of activity to be maintained over the year. The Delta Independent Science Board has a number of reviews going on which they will report on regularly to the Council. With several new members on the Council, Councilmember Mike Gatto suggests an informal yet public meeting with staff to discuss the priorities; other councilmembers seem to like the idea. Executive Officer Jessica Pearson notes that the five-year review of the Delta Plan will provide opportunities to discuss the history and the parameters. Chair Tatayon says the Council is standing on the shoulders of giants, from the Delta Vision process, the passage of the Delta Reform Act, and the first Council who set the initial direction of the Council and passed the Delta Plan. She appreciates the newer members wanting to understand the context of the Delta Plan and the work that has gone on before them. She agrees with retreat or informal meeting is a good idea to discuss the statutory requirements, the priorities that were set before, and to review the 2019 priorities. Rather than a retreat, this could occur as part of one of the Council’s regular meetings. Ryan Stanbra, Legislative and Policy Advisor, gave the legislative update. The legislature convened on January 7th with Democrats holding super majorities in both houses. SB 19, authored by Senator Bill Dodd, would require DWR and SWRCB to develop a plan to deploy stream gauges in places in where a lack of data contributes to conflicts in water management. The legislation would apply statewide. SB 19 is a reintroduction of SB 919 from last session which died in Assembly appropriations committee. SB 134, authored by Senator Hertzberg from Van Nuys. 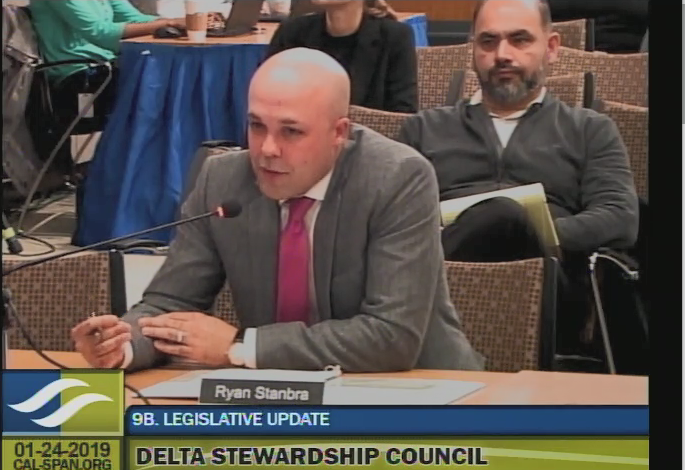 Stanbra said the legislation appears to be intended to start the discussion of cleaning up any potential clean up items on the water conservation bills passed last year (SB 606 and AB 1668). The Governor submitted his budget on January 10; it included a proposed tax on drinking water to clean up contaminated water systems in disadvantaged communities, as well as funding for wildfire safety, prevention, and emergency preparedness. Department of Water Resources: $117 million from a mix of Prop 1 and Prop 68 resources to fund systemwide flood improvements in locations such a the Yolo Bypass, and Paradise Cut, and urban flood risk reduction projects in places like the Stockton portion of RD 17 and the Southport area. Mr. Stanbra reminded that the Governor’s budget is the first step in the process, with budget hearings to follow in the early spring, the revised budget based on updated revenue figures in May, and the adoption of the budget in mid June. Proposal Solicitation Process (PSP) Underway: In October, the submittal period closed on a request for proposals to fund science research on priority items listed the science agenda. The PSP is joint request between the Council, the Department of Fish and Wildlife, and the Bureau of Reclamation. The multi-agency solicitation will award up to $12 million focused on Delta scientific studies. 62 proposals were received requesting $43 million. There will be panels to review the proposals in February and Marsh. Dr. Callaway anticipates coming to the Council in April for approval of the selected projects. The Department of Fish and Wildlife will consider their projects separately. Click here for more information. Social Science Task Force: Dr. Callaway spoke briefly about the effort by science program to get traction and momentum on social science work in the Delta. Recognizing the long-standing interest to support such work, the Delta Science Program has put together six-member task force of leading social scientists from around the country who are engaged in similar work. They will work through the spring and summer to draft a strategy for implementing social science activities. He anticipates the task force will issue their findings sometime in the summer. Adaptive Management Forum: On February 5 and 6, the Delta Science Program is hosting an Adaptive Management Forum. The forum is an opportunity for practitioners to learn about adaptive management and the current state of the knowledge and will include case studies from within as well as outside the Delta. Dr. Callaway said the idea is to identify how adaptive management is being used effectively, and garner more specific information about how to develop an adaptive management plan and incorporate monitoring into adaptive management. Considerations for the Use of Captive-Reared Delta Smelt for Species Recovery and Research. Lessard, JoAnna; Cavallo, Brad; Anders, Paul; et al. San Francisco Estuary and Watershed Science. October 2018. The paper argues that given the state of the current population of Delta smelt, we should move forward with some experimental reintroductions of the captive-bred Delta smelt and begin to evaluate if it is possible to use the fish to aid in recovering the species. The paper acknowledges regulatory issues surrounding introducing captive-reared smelt is a major challenge. The councilmembers discuss potentially advocating for use of captive-reared Delta smelt to help recover the species. Council staff and Lead Scientist will put together a presentation to provide more information for Councilmembers at an upcoming meeting. Water Primrose Invasion Changes Successional Pathways in an Estuarine Ecosystem. Khanna, Shruti; Santos, Maria J.; Boyer, Jennifer D.; et al. Ecosphere. This paper looks at the recent expansion of the invasive water primrose, which was seen in the Delta as early as in the 1940s, but only recently started to dramatically expand. In some areas of the Delta, it has quadrupled. One hypothesis for the spread is it is likely moving into areas that were previously colonized by water hyacinth because where water hyacinth was treated, the primrose has expanded. There was not a permit in place to allow treatment of primrose until 2016. Water primrose is a rooted plant that is expanding into marshes; it roots on the edges of the marsh and grows up over other plants on the edge of the marsh. This paper highlights that although we know invasive species are an issue, there’s new species occurring and new kinds of changes that are going to come with those species that we have to think about and incorporate into management plans, said Dr. Callaway. Council welcomes new member: The Delta Reform Act specifies that the Chair of the Delta Protection Commission also serve on the Delta Stewardship Council, so the Council welcomed Yolo County Supervisor Oscar Villegas to the Council as the new chair of the Delta Protection Commission. Mr. Villegas will be replacing the outgoing chair Skip Thomson. New staff at the Council: Executive Officer Jessica Pearson announced several positions at the Council have been filled, mostly notably that Dr. Louise Conrad will be joining the staff as Deputy Executive Officer for Science in February. Council adopts amendment to modify Delta Plan policy G P1(b)(2): The Stewardship Council voted unanimously to adopt an amendment to clarify that all mitigation measures adopted and incorporated into the Delta Plan, including the new mitigation measures identified in 2018, apply to covered actions. There was only one comment received from DWR during the comment period regarding a clarification, and there was no one to comment during the public hearing. Public hearing on Smith Canal: The Council held a public hearing on the appeal of the consistency determination for the Smith Canal project in Stockton. This project has been in the news, here and here. I won’t be covering this, but you can view it on the webcast by clicking here. To watch meeting on webcast, click here.